Need more information about booking Property 6419678 ? Location! Location! Location! Fabulous mountain and fairway views in beautiful Monterey CC. Cathedral ceilings show off the expansive living room that opens to the West facing back patio. There's new carpet throughout as of Summer 2018. The newly remodeled kitchen sports stainless steel appliances and granite counter tops opens to the living room with a breakfast bar. There is dining for 6 in the spacious dining area. 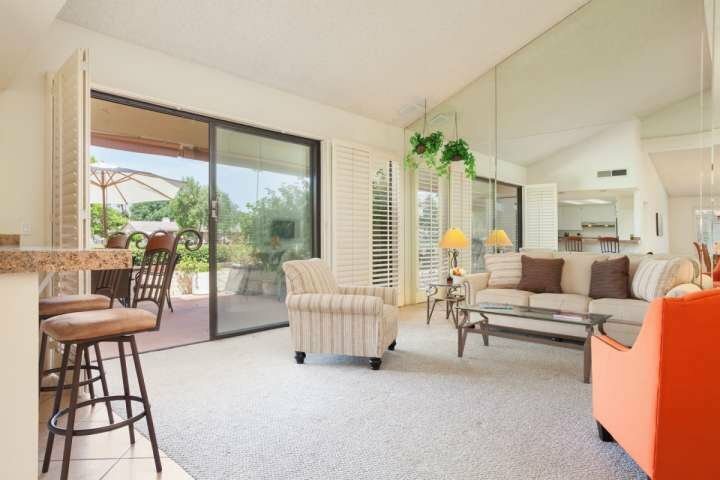 The Beautiful large western facing patio is great for entertaining while cooking something up on the gas grill or just sipping wine and watching the sunset, or counting the millions of stars in the clear desert sky. The very comfortable King bed is a great place to end your day of fun. Multiple closets and a dresser make it easy to store all of your clothes. Theres a wall mounted flat screen TV so you can watch your shows in bed. The large En suite bath has a double vanity, walk-in shower, and a tub for soaking away the stresses of shopping, golfing, hiking, or sunning. Cheery and bright with a Queen bed, dresser and closet. En suite guest bath has a step-in shower. There's lots of seating and a large HDTV for family gathering or for the extra guests. The Den has an En Suite bath complete with Jacuzzi tub. For parking just pull into the spacious 2 car garage or driveway. A full sized washer and dryer is provided in the garage for your convenience. The community pools are just a few condos away. For a fee, Monterey Country Club offers guests a monthly Golf package, and daily tennis & fitness. Please call the Club House for the current rates: *******-9311. Close enough to walk to the famous Palm Desert Street Fair. 2 miles away from world class shopping and restaurants on El Paseo, the Rodeo drive of the desert. 20 minutes from the Palm Springs Airport. Centrally located for all of the offerings of Coachella Valley. Just pack your sunscreen and we will provide the sunshine! Estimated price per night based on a weekly stay. Owner fees of $380.00 per stay may apply. Enter your dates to see the total cost.